Community Programs manager Megan Leafblad conducted the following interview, a version of which appears in the July/August issue of WALKER magazine. 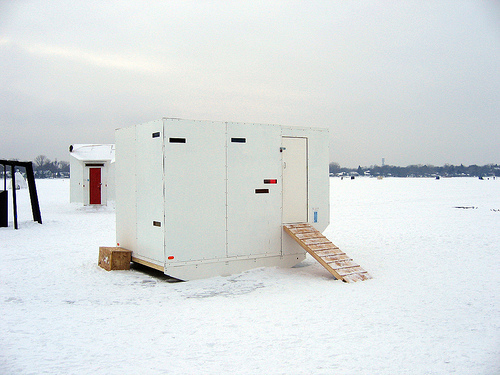 A karaoke hut on a frozen lake is not necessarily the first thing that comes to mind when you are looking to interview a family about the Walker. But as luck would have it, this is where I first met the Zoll family. 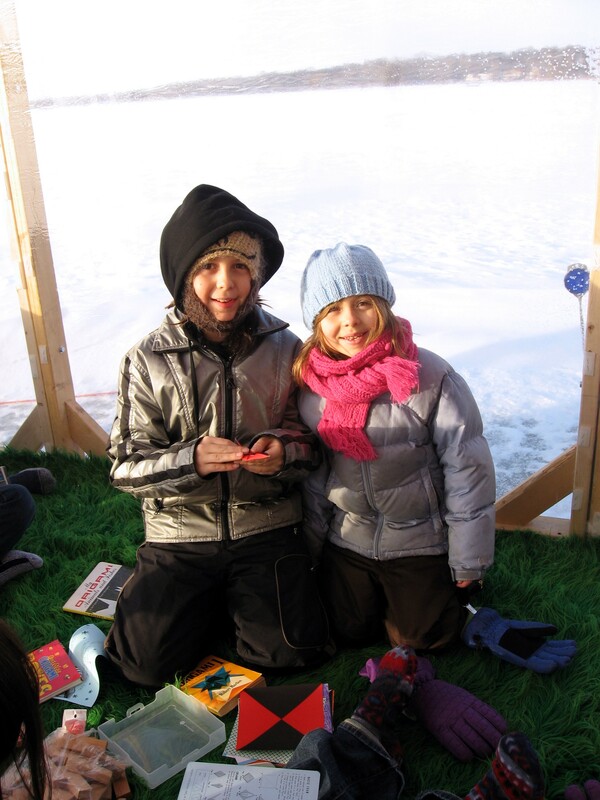 This past winter a group of friends and I participated in the Art Shanty Projects, in which artists build structures inspired by the tradition of ice fishing during Minnesota winters. On one of my many trips to sing karaoke at the Norae Shanty, I was blown away by a father/son duo who sang “Fulsom Prison” by Johnny Cash. Sitting out in the cold listening to Cash come back to life I thought to myself: This family rocks, I want to know them. At the time I was absorbed by having to follow their performance up with my own rendition of “Ice, Ice Baby.” Luckily for me I ran into the Zoll family in the Walker galleries at a recent Free First Saturday and was able to have a more in-depth conversation with Forrest (age 10) and Ingrid (age 7) about art and growing up with a dad who lulls you to sleep with Johnny Cash tunes. Megan Leafblad: If you could only use one word to describe Raushchenberg’s Trophy II (for Teeny and Marcel Duchamp) what word would you pick? ML: Why did you pick that word? FZ: It is really creative that he put in objects. IZ: I think it is funny because I don’t know why people would put things like glasses and spoons and clothes in art, and it seems very strange to me. ML: What is the funniest piece you have seen on view at the Walker? FZ: The Dolphin [Oracle II]. It says funny stuff and I’ve talked to it before. IZ: I can’t decide between the everyday object and the Dolphin. It’s so hard to choose. ML: What is your favorite experience coming to the Walker? FZ: I like walking through the sculpture garden when the weather is warm. IZ: I like seeing the cherry. ML: What is your favorite piece of artwork in the collection? FZ: Well, right now I just found the Flags one. It’s pretty cool, and I think that might be my favorite. IZ: My favorite piece so far today is the Dolphin. ML: What did you and the Dolphin talk about? ML: Do you make art? FZ: Yeah, I make art. Right now I am doing a video project on this street artist called 27, who does a lot of street art. And I’ve interviewed a person who owns a warehouse that got graffitied. ML: How did you find out about this artist? ML: What do you think makes art good art or bad art? Why were you attracted to 27’s work? FZ: Most other graffiti artists tag their names, and he made pictures. I had an idea of how I wanted to draw, and he was basically doing that. I think anything can be good art, if you really look at it.